When it comes to maintaining your hydraulic rockbreaker, absolutely the most important thing you can implement into your routine is lubricating the tool. This preventative maintenance routine can you save you time and money. Manual greasing of your hydraulic hammer is often a real pain. However proper lubrication is critical to extending its life. It’s a painstaking but straightforward task to be repeated every two hours of continuous use, or when the tool becomes dry and shiny. Failure to grease regularly will significantly increase wear rates and reduce the lifespan of your tool, bushings, and front head components. Firmly pressing the tool up inside the hydrualic rockbreaker prevents excessive grease from entering the impact chamber. Excessive grease in the impact chamber will cause a hydraulic lock, which depending on the amount, can cause a lack of power or immediate seal failure and ingression of grease into the hydraulic system when the rockbreaker is fired. 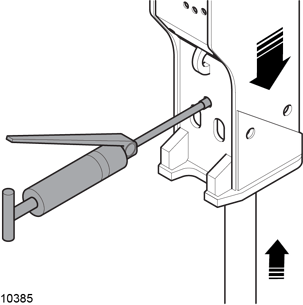 The hydraulic hammer must be in a vertical position to grease, with enough down-pressure to push the tool up inside the housing. Grease until clean grease oozes out around the tool and retainer pins. Grease hydraulic hammer after every two hours of continuous use, or when the tool appears shiny where it rides inside the front head. Remember to use the manufacturer recommended grease. We recommend a the BTI chisel paste or equivalent to lubricate all BTI’s hydraulic rockbreakers. Using general EP purpose grease is not recommended. It will melt and run down the tool, providing inadequate lubrication. Refer to page two to learn how to grease your machine. Don’t want to grease your machine manually? BTI offers a number of breaker mounted and carrier mounted auto-grease option for most of its rock breaker line, saving you time and effort. If you’re tired of losing valuable working time to manual grease the tool, BTI’s auto-grease system will save you time and your investment. 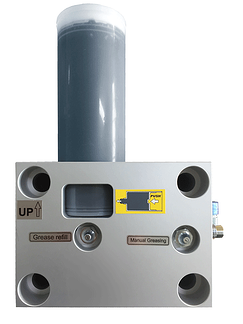 A provision hole for automatic greasing systems is provided on BTI’s CX8, and all BX and BXR models. Need to know how to keep your hydraulic breaker working for you? Be sure to download our maintenance guide with a comprehensive checklist. Like This Article? Remember To Share!